Selected in the fourth round (28th overall) of the 2013 CFL draft and signed on Jan. 8, 2014. Power originally signed with the Stampeders on May 21, 2013, and spent six weeks on the practice roster before returning to university. (Calgary) Power played 16 regular-season games and ranked third on the team with a dozen special-teams tackles. Power also had a blocked punt in a season-opening victory over Hamilton. In the Grey Cup game, he recorded three special-teams tackles. (Calgary) Power played 18 games (three starts) and had 17 special-teams tackles and a punt block. He had one special-teams tackle in the Western Final and one special-teams tackle in the Grey Cup. (Calgary) Power played all 18 games and recorded 17 special-teams tackles, one defensive tackle, one forced fumble and one blocked punt. He also had two catches for four yards. Power played in the Western Final and recorded two special-teams tackles and he also had one special-teams tackle in the Grey Cup. (Calgary) Power played 13 games and had one catch for six yards, nine special-teams tackles and a forced fumble. He was on the one-game injury list for four games and the reserve list for one game. Power played in both playoff games and recorded one special-teams tackle. (Calgary) Power played two games, making his CFL debut in the Labour Day Classic and getting into the lineup again on Oct. 24. He began the season on the one-game injury list before being placed on the practice roster. (Calgary) Power spent six weeks on the practice roster before returning to university. After starting the 2013 season on the Stampeders’ practice roster, Power returned to Saskatchewan for his senior season and played eight games as a receiver, making 14 catches for 143 yards and one touchdown. On special teams, he recorded 10 total tackles including eight solo stops. Power also returned three kickoffs for 35 yards. In Saskatchewan’s playoff game against Manitoba, Power had four catches for 62 yards. He played eight games for the Huskies in 2012, making 18 catches for 231 yards and two touchdowns. Prior to 2012, Power played linebacker for the Huskies. In 2011, he recorded 16 tackles and one fumble recovery in eight games. 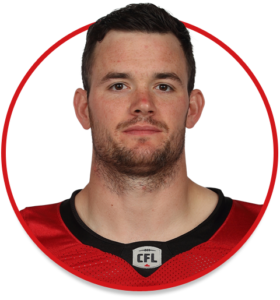 Power is the Stampeders’ player representative for Canadian Blood Services. Prior to playing for the University of Saskatchewan, Power played both offence and defence while attending Holy Trinity Academy in his hometown of Okotoks. During his time at the Academy, he was a three-time winner of defensive player of the year honours.